It’s important to recognize when moisture levels can become a mold-inducing problem. Mold’s best friend is moisture, and depending on the humidity, rain and storm frequency in Boca Raton, FL along with the chance of water leaks, your business may be at risk for unwanted fungus growth. Therefore, it’s important to recognize when moisture levels can become a mold-inducing problem. Learning how to identify and prevent the spread of mold, including Stachybotrys chartarum (also known as black mold), in your business is key to reducing your long-term costs and maintaining a clean environment. While mold spores exist everywhere in small quantities, there are a few common signs your commercial building may require mold cleanup. 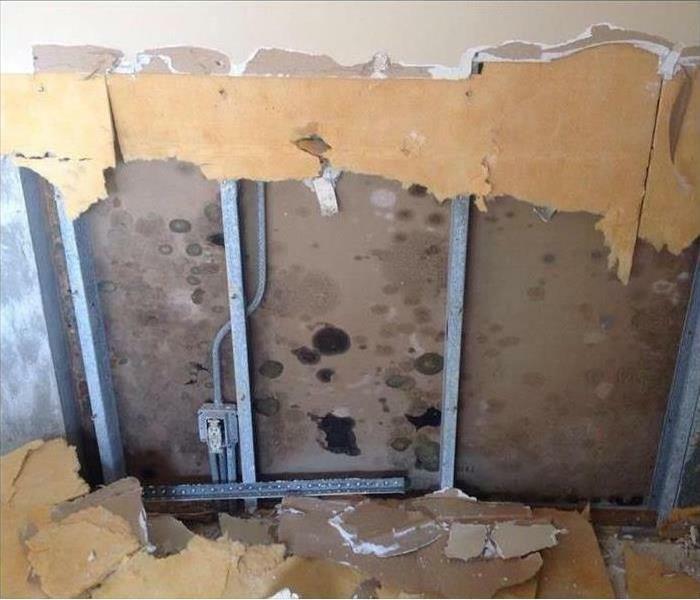 Mold is a fungus that can easily grow in water-damaged or damp buildings, and a moisture problem in materials high in cellulose such as fiberboard, lumber and drywall is especially conducive to growth. Water leaks, persistent humidity levels above 45 percent or flood damage can quickly result in mold overgrowth within a commercial building. While there are many types, remediation efforts in a commercial building are often the same regardless of type. 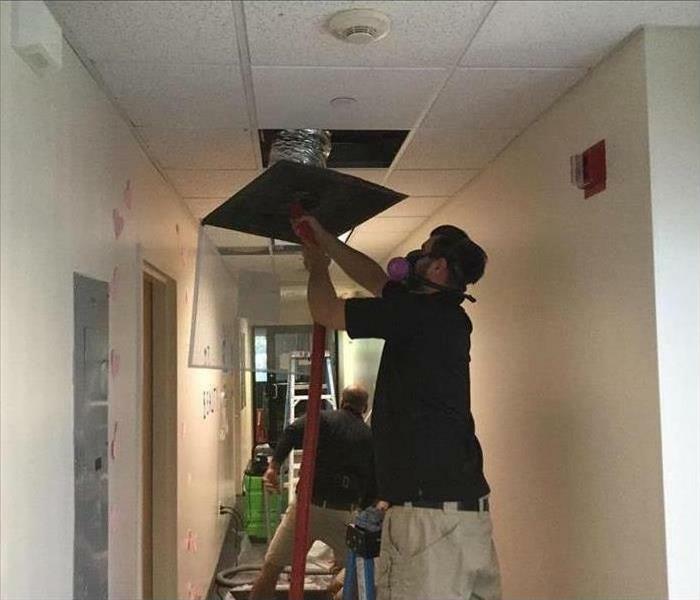 If you suspect black mold or another type of growth in your business, the first step to solving the problem is to call a mold remediation specialist. A professional can help you address and resolve any moisture issues at the root of the problem. He or she can also provide a comprehensive remediation plan, including halting the spread of the fungus, air filtration, mold cleanup, removal and restoration. If you have a moisture problem or mold in your commercial building, don’t wait to address it. Call for professional assistance before a small issue becomes a large one. Fire Damage at a local Boca Raton, FL facility. After a fire at your Boca Raton, FL, business, the cost of cleanup and repair can run anywhere from several hundred to several thousand dollars, depending on the severity. The particulars of your insurance policy will also determine the price, depending on your deductible and what out-of-pocket costs you may incur. By working with the insurance adjuster and a professional fire restoration company, you should be able to get a good idea of the cost involved. Below are the main things to consider when creating an estimate. The emergency cleanup makes sure no further damage is caused to the property through exposure to the elements or vandalism. Any holes in the walls or roof will be boarded up or covered with tarps, and any standing water will be removed from the building. There may be further cost if security fencing is installed. Depending on the severity of the fire, and whether or not sprinklers were installed, the fire company may have used a great deal of water to subdue the blaze. Carpets and upholstery may be soaked, the structure itself may be waterlogged, and there may be mold and bacteria that need to be mitigated. Also, firefighters may have used chemical extinguishers that leave residues and contaminate the air. Special equipment must be employed to dry, dehumidify, clean and sterilize. The cost of cleaning up damage and odor from smoke and soot must be figured in to the estimate as well. The methods and equipment used will depend upon the type of combustible substances. Smoke and soot from wood, protein or synthetic material will each create a different kind of cleanup problem. After the cleaning and disinfecting are completed, the actual replacements and repairs can take place. Depending on how bad the actual fire damage was, repairs may involve only replacing carpeting and repainting, or it may entail rebuilding entire rooms. 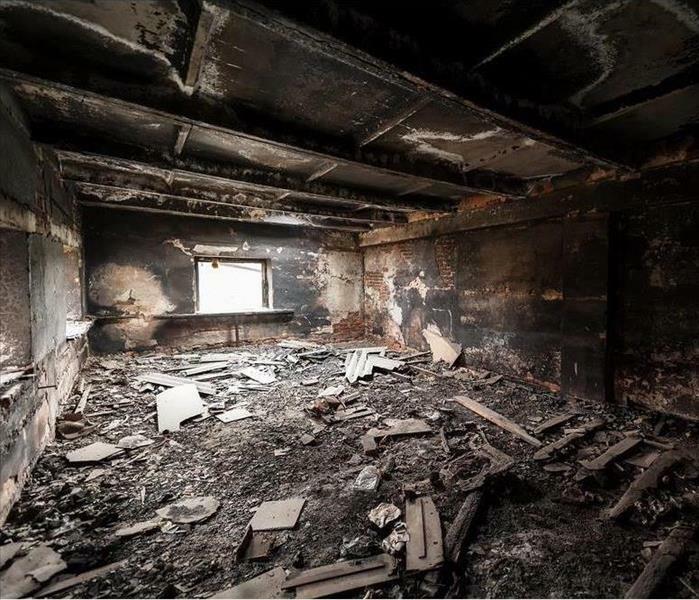 While the cost of repairing damage from a commercial fire can vary greatly. However, it should not be difficult to estimate once all of the factors are taken into consideration, and the damage has been assessed by a qualified professional. If you have any questions, please give us a call at (561) 391-3366. SERVPRO of South Palm Beach has the training, experience, and equipment to handle large commercial fire damage emergencies and is ready to respond immediately. Storms can cause extensive damage to the exterior of a commercial property. Depending on the level of commercial insurance coverage held by the building owner, there may be limits on the external portions of the property that are protected. Review your coverage, schedule a building inspection, and perform exterior maintenance on a regular basis. Five steps that will help owners prepare the exterior of a commercial property for a storm. 1. Choose exterior doors rated for high wind speeds. Exterior damage quickly becomes interior damage if a door fails. Exterior doors should be tested to stand up to wind loads and the frames should be anchored. Check to make sure these doors have appropriate drainage, flashing, sealant, and tracks. Door failure rapidly raises internal pressure and can cause structural damage. Functional drainage systems prevent water from pooling on the roof or around the foundation of a structure. Clear roof drains, downspouts, and gutters several times a year as part of an exterior maintenance routine. Removing dead or loose branches from nearby trees can limit the extent of storm damage. 4. Secure loose items that may blow away or cause damage. Don't forget about antennas on the roof or potted plants and trash cans on the ground. 5. Anchor outside HVAC equipment. These components should be securely installed on a concrete pad. Depending on the severity of a storm, you may want to use hurricane straps or shut off these systems and cover equipment with a secured tarp. These five exterior maintenance and storm preparation steps can help owners limit the extent of damage to the exterior of a commercial structure. Keeping your building maintained can pay off during adverse weather events. If the exterior or interior of a commercial property becomes damaged during a storm, contact a restoration company located in Boca Raton, FL. SERVPRO of South Palm Beach has the training, experience, and equipment to handle large commercial storm damage and can respond quickly. Landscaping with strategic design can help to reduce the risk of flooding in regions with heavy precipitation. Landscaping is not just for looks. Strategic design can help to reduce the risk of outside flooding at your home in Boca Del Mar, FL. If you live in a region with heavy precipitation, you should consider the following tips. Three ways to facilitate rain drainage. The grade of your property should divert water away from the foundation of your home. You may want to consider adding swales to redirect water down into ditches. Line the lowest part with rocks or plants that have deep roots and high water tolerance to slow water flow. A French drain can also be a functional solution for outside flooding. In addition to growing plants in swales, you may also want to install a rain garden. The plants in this garden should have high tolerance for wet soil and should be native so that they require little maintenance beyond rainfall. Water can pool in these gardens during a rain storm and percolate down into the soil. Use heavier mulch in other garden beds to prevent wood from floating off and clogging drains. You should also be sure not to over-water beds situated near the foundation of your home. A functional drainage system is essential for preventing leaks and flooding. 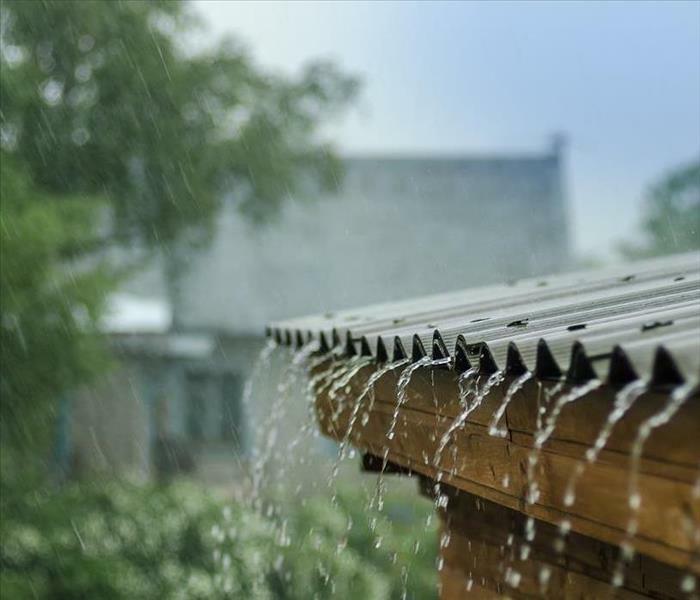 Make sure that gutters and downspouts are clear and that the outlets are diverted to prevent water from pooling next to the exterior walls of your home. You can also extend downspouts or install gutter guards. These are three ways to use landscaping to reduce the issue of outside flooding at your home in Boca Del Mar, FL. You may want to consult with local rain drainage specialists to come up with the best solutions for your property. If your home floods, you can count on the expertise of storm and water damage restoration professionals. Are Storm Shutters Right For Your Home? Storm Shutters and Panels can protect your home from high winds and flying debris. Storm shutters and panels can protect the doors and windows of your home from high winds and flying debris. Here are a few considerations to help you decide whether shutters will be a good investment in the safety of your home in Boca Del Mar, FL. If high winds and flying debris occur frequently, you should select heavy-duty materials and permanent installations. Removable or ornamental options may meet your needs if storms are less frequent or severe. There are several shutter styles available for sale. Choose the design that is the easiest and most effective to use. Storm panels are very affordable, at about $7 to $15 per panel. Accordion and Bahama designs are priced at about $15 to $25 per square foot of window. Rolling installations range from $20 to $30 per square foot. Colonial designs cost up to $200 to $500 per window. Fabric storm panels are less effective and cost anywhere from $75 to $300 per window. You can protect your home at a cost that ranges from $500 all the way up to $8,000 for top-of-the-line, permanent protection on many windows. The average price is between $2,000 and $5,000. 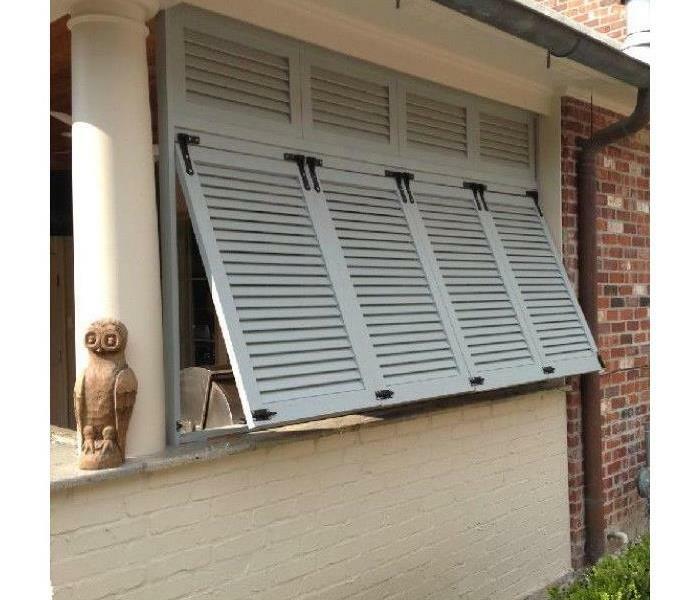 Choose storm shutters that can protect your home. If high winds result in damage, rely on a storm damage mitigation and restoration service in Boca Del Mar, FL. SERVPRO of South Palm Beach specializes in flooding and storm damage restoration. If you are using the purifier to improve the air quality of your home, you may want to consider a purifier with a HEPA filter. Mold spores are floating everywhere, outside, at work, and into your home. You can't completely prevent them from getting into your home, but you may be able to reduce the possibility of mold growth within your home. A top-quality air filtration purifier can trap spores and destroy existing mold. As you research your options, there are some terms you should understand. 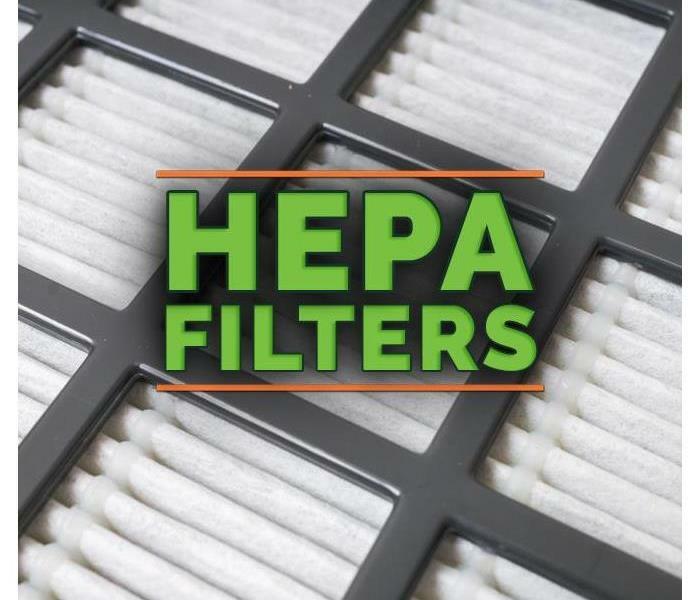 HEPA filter: This high-efficiency particulate air filter can remove up to 99.97 percent of particles that are 0.3 microns or larger. These filters are used regularly but can become home to mold if they aren't changed regularly. Ultraviolet germicides: These products operate by irradiating the air to kill mold, bacteria, and viruses. The EPA warns that most appliances won't generate the necessary amount of radiation to effectively protect your home. Carbon filters: An air purifier with this type of filter traps gases on a filter of activated carbon. It doesn't remove particles from the air so much as it captures airborne chemicals. Ionizing purifiers and ozone generators: This technology uses electric charges to make particles attractive to surfaces. The ozone generated by these air filtration products can be problematic if you aren't careful. The type of air purifier that's best for you depends on your situation. If you are using the appliance to treat an isolated mold problem, an ozone generator may be the most effective tool. If you are using the purifier to improve the air quality of your home, you may want to consider a purifier with a HEPA filter. The next step to completing this decision is to determine the right size of purifier. For this part of the decision, it may be helpful to discuss your options with a local mold remediation and prevention company. These professionals can help you determine your level of risk and take accurate measurements of your home. There are many impressive air filtration products available in Boca Raton, FL. Use available resources to make the decision best for your home and family. There are a few things you can do before leaving that can help prevent possible problems. When leaving for vacation you may want to know that your Boca Raton, FL home will remain safe. The last thing most homeowners want to come home to is the need for a water pipe repair. Fortunately, there are a few things you can do before leaving that can help prevent possible problems. You may want to look around to see if you have a broken pipe, or other repair needs before you leave. This will allow you to locate and take care of damaged areas before any potential problems get worse in your absence. If you're leaving during colder weather you can also take the time to insulate any exterior pipes against the cold. This may help prevent them from freezing and alleviate the need for a water pipe repair when you return. Another step you can take to protect your home is to clean out any gutters and drains. Keeping these clear of debris can prevent water overflow which can back up into your home. Walk your house sitter through important aspects of your home before you leave can help prevent a flooded home. Show them where the water shut-off valve is, and any numbers they may need to know in the event of an emergency, such as your preferred water damage restoration service. When trying to prevent a possible water pipe repair need while you're away, there are a few steps you can take. Check for any pipes are damaged before leaving your home, and insulate any exposed pipes against possible cold weather, clean out your gutters and drains to prevent back up, and walk her house-sitter through any important information they may need to know. How Does a Disaster Recovery Team Respond To Storms? The SERVPRO business model is designed to sustain fast responses and a high quality of service. A disaster recovery team should swiftly arrive on location after a severe storm in Boca Raton, FL. These trained professionals can assess storm damage and take mitigation measures. Learn more about the stages of storm response. An independent mitigation company may not be able to keep up with the volume of calls after a disaster or severe storm. The SERVPRO business model is designed to sustain fast responses and a high quality of service. The availability of trained professionals and specialized equipment is likely to make any storm response more successful. A corporation built on a franchise business model has all of the resources necessary to respond to large losses. One of the best ways to ensure that mitigation and restoration will combine in a successful effort is to rely on the same company to provide both services. Separate mitigation and restoration companies will give clients and insurers more than one estimate and increase the possibility of miscommunication or scheduling difficulties. An all-in-one service can get the job done better and faster and make it easier to settle an insurance claim. The best disaster recovery teams have fast response times and the equipment and expertise necessary to complete any job. In the event of storm damage, a commercial property owner should contact a one-stop mitigation and restoration company in Boca Raton, FL. As a homeowner you always want to make sure you have emergency contacts close by in case anything unexpected happens. For a business owner, having that information could be the difference between staying in business or not! SERVPRO of South Palm Beach realizes that you might not think about the all the unexpected things that could happen to your Boca Raton business from floods, fire or mold damage. That's why we have our Emergency Ready Program (ERP) available to you! Our ERP is a great way to reduce business interruption following a disaster, plan for it now! As many as 50% of businesses may never recover following a disaster, according to the latest industry research. 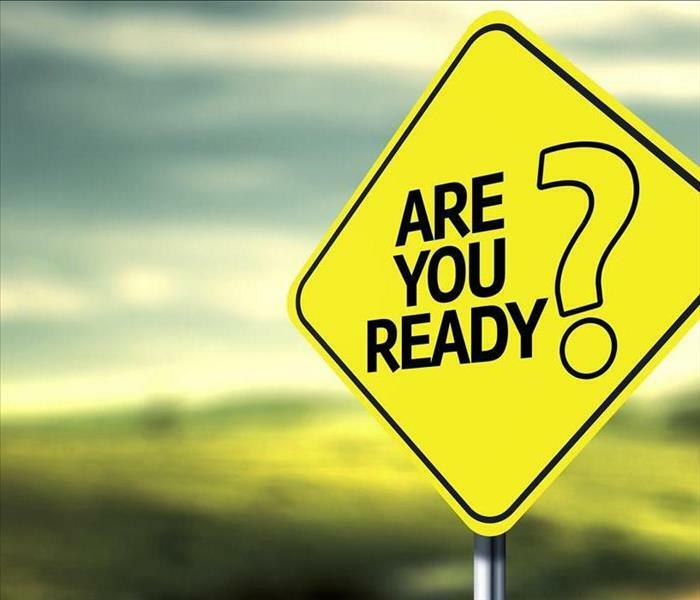 Of the businesses that survive, the overwhelming majority of them had a preparedness plan in place. Pre-planning can serve as an insurance policy aimed at peace of mind. By having SERVPRO of South Palm Beach create and ERP for your business, you minimize business interruption by having an immediate plan of action. Knowing what to do and what to expect in advance is the key to timely mitigation and can help minimize how water and fire damage can affect your business. SERVPRO of South Palm Beach will provide a complimentary assessment of your facility which means there is no need to allocate funds, so this is a great value at no cost. A concise profile that contains only the critical information needed in the event of an emergency will be created and it will only take a little time to complete and will not take you away from current projects. 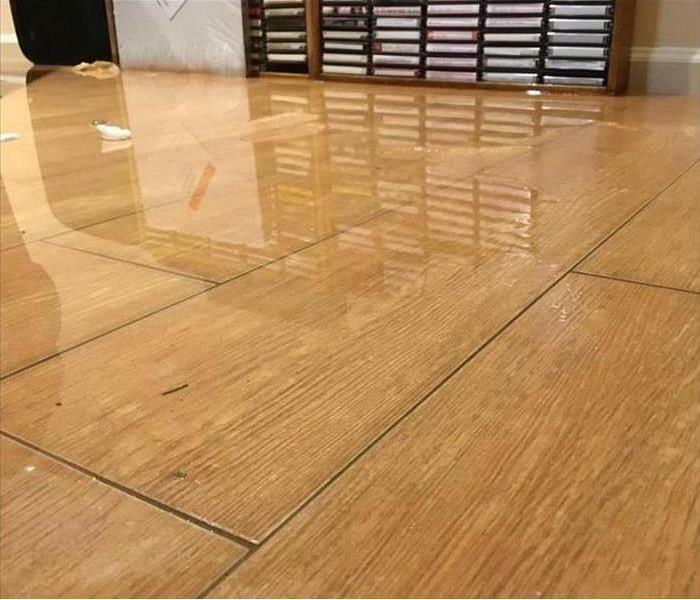 This can help minimize the amount of time your business is “down” following a Boca Raton water damage, by having an immediate plan of action and connection to SERVPRO of South Palm Beach. This saves time so we can begin the work of mitigating the damage which can save you time and money. The ERP will provides facility details such as shut-off valve locations, priority areas and priority contact information. Having a quick reference of what to do, how to do it and who to call provides solutions in advance of an emergency so that during the emergency you are “Ready for whatever happens.” Give SERVPRO of South Palm Beach a call today @ 561-391-3366 and set up your ERP! Mold is a natural part of many environments. In outdoor conditions, it plays an important role in breaking down dead organic matter, but you want to avoid mold growth indoors. Here’s a look at why you may have a Boca Raton mold problem and how to tell if you need professional mold removal services. Do I Need Professional Mold Removal Services? Visible mold: It’s easy to see mold growing on windowsills, shower walls, or under bathroom sinks. With a little more effort, you can also check the attic and crawlspace for visible mold growth. Where there’s a little mold, there is always the possibility there could be more. Signs of excessive water: Stains on the wall or ceiling could indicate a roof leak, which probably means the insulation in the attic is damp and harboring mold growth. Bubbling, peeling, or cracking paint on the walls and ceiling are other clues that excess water is coming from somewhere. Condensation: If condensation forms on the inside of windows or other smooth, cold surfaces, that’s a sign the humidity is too high indoors. Excess humidity creates an environment for mold to thrive. Past water trouble: If you know you had a leaky roof, burst pipe, or flooding in the past, fixing the problem is just the first step. If you didn’t perform mold removal when you fixed the source of excess water, some may have been left behind. Remember, even if no mold is visible from your vantage point, that doesn’t mean mold couldn’t be growing behind the wall where water seeped through. Health problems: Many people are allergic to mold, which may cause respiratory problems including sneezing, wheezing, shortness of breath, throat irritation, and asthma symptoms. The onset of new symptoms or worsening of existing conditions while you’re at home could be a sign that mold is growing there. Musty smell: Mold gives off a certain smell that even those without allergies can detect. Don’t ignore the presence of a musty odor; you may not be able to see any mold, but it could still be growing under the carpet padding, around the foundation, or behind the bathroom tiles. Toxic symptoms: Mycotoxins from certain molds have more severe repercussions than causing allergic reactions. They can cause headaches, difficulty concentrating, memory loss, dizziness, and other mental effects. Don’t ignore these signs. Contact SERVPRO of South Palm Beach to have your Boca Raton home inspected for mold growth and begin the remediation process today. 4/5/2019 - Is the Exterior of Your Commercial Property Ready for a Storm? 4/5/2019 - Are Storm Shutters Right For Your Home? 4/4/2019 - How Does a Disaster Recovery Team Respond To Storms?